Early in the morning of Saturday 14th. September, 1805, at about 6.00am, the post chaise [horse-drawn carriage] carrying Vice Admiral Lord Nelson passed through the great Landport Gate on the north side of the complex fortifications ringing the naval town of Portsmouth. Swinging sharply to the left, along the foot of the ramparts to the huge tree-fringed Townmount Bastion, it then turned right into the High Street. There, it drew up in front of the bow windows of The George Hotel and deposited its weary passenger, who had been on the road since 10.30 the previous evening. But there was little time for resting. After a quick breakfast, Nelson was on the move again: this time to the Dockyard to pay a courtesy call on Commissioner Saxton and then back to The George before noon, where he was joined by two members of the Government who had come to wish him God-speed, George Rose, the President of the Board of Trade and George Canning, the Treasurer of the Navy. By now, news of his arrival had spread and a large crowd had gathered in the narrow streets outside the hotel. The usual point of embarkation for officers was at the Sally Port, just a few hundred yards away, at the seaward end of the High Street. But the crowd was so dense that a passage through would be difficult and so it was decided to take an alternative route. Leaving the Hotel by a back door giving onto Penny Street, Nelson then turned left into Green Row (now Pembroke Street). So the famous last walk began. It has become a poignant and familiar part of the Nelson Legend: captured for us by painters and writers alike; perhaps most memorably by Southey who recalled that “Many were in tears and many knelt down before him and blessed him as he passed”. (1) And yet, the exact route that Nelson took has proved elusive. Most of the painters who depicted his departure got the topography wrong (for example, A.C. Gow’s splendid and deservedly popular painting shows him descending the steps at the Sally Port). The Victory anchor, placed by the Victorians on Southsea Esplanade to mark the supposed point of embarkation, is at least 400 yards too far east. And the fine statue of Nelson by Brook Hitch on Southsea Common, which purports to stand on the line of his route, is also many yards from the path he actually trod. So can we reconstruct Nelson’s route ? There are a number of clues: some in the written accounts; others in contemporary prints and plans. So far, so good: but now another problem arises. As we have seen, Nelson began his walk by turning into Green Row (now Pembroke Street) but at that time this was a cul de sac [dead-end] with its eastern end blocked by the great earth ramparts. Later, in 1833, the King William Gate was cut through the ramparts to give access to the increasingly fashionable resort of Southsea but in 1805 there was apparently no exit to the beach. Once again, the Portsmouth City collections come to the rescue: this time in the shape of plans of the fortifications. These show that there was just one exit to the beach from the eastern end of Portsmouth town: a tunnel through the ramparts which gave access, via a drawbridge over the moat, to the Spur Redoubt, erected in 1680 to defend the seaward front of the defences. From the Redoubt, a small sally port opened onto the beach ….. within a few yards of where the bathing machines were placed ! Clearly, this could well have been the route that Nelson took. “… by the time he had arrived on the beach some hundreds of people had collected in his train, pressing all around and pushing to get a little before him to obtain a sight of his face. I stood on one of the batteries near where he passed and had a full view of his person. As the barge in which he embarked pushed away from the shore, the people gave three cheers which his Lordship returned by waving his hat”. The only “battery” with a view of the stretch of beach where Nelson embarked (ie, where the bathing machines were located) is the King’s Bastion which directly overlooks the drawbridge leading to the Spur Redoubt. It seems fairly likely, therefore, that this is where Silliman stood – and this in turn confirms that the tunnel through the ramparts and the sally port in the Spur Redoubt are likely to have been the route taken by Nelson. In fact, the tunnel has been reopened only comparatively recently and so it is possible for us today to follow in Nelson’s footsteps more precisely than almost any previous generation. Start in Penny Street, about 100 yards to the north of the junction with Pembroke Road. This where the back door to The George Hotel was originally situated. Turn left into Pembroke Road. The view across Governor’s Green to the Garrison Chapel is almost unchanged since Nelson’s day – although the chapel lost the roof of it’s nave during the World War II blitz. All other buildings in the area are post – 1805. About 200 yards along Pembroke Street is a single storey redbrick building on the right hand side of the road. This is the old guardhouse for the King William Gate rected in 1833. In 1805, the street terminated at this point, at the foot of the earth ramparts. Immediately past the guardhouse, turn right down a narrow path leading along one side of Governor’s Green. This is almost certainly the path Nelson would have taken, with the great ramparts towering above him on his left. 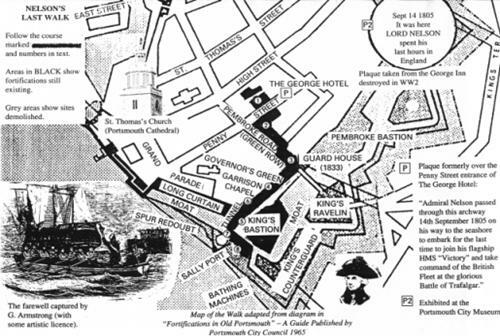 (It is just possible that Nelson walked directly across Governor’s Green, in a south-heading diagonal from Penny Street to the King’s Bastion, but local tradition supports the longer, less direct route. There is no firm documentary evidence in favour of one or the other). At the end of the path are the remains of the C18th seaward defences. The large mound on the left is the King’s Bastion, from the top of which (probably) Benjamin Silliman watched Nelson pass by. At the foot of the rampart, just to the right of the Bastion, is a low brick-lined arch, leading to a narrow tunnel through the wall. This is the route Nelson took and here you can be certain you are treading directly in his footsteps. The tunnel leads onto a bridge crossing the moat. Ahead are the foundations of the Spur Redoubt (which was demolished in Victorian times to make way for the Esplanade). Crossing the bridge, turn left into the Redoubt. A narrow passage leads through the Redoubt wall. This is the “sally port” through which Nelson passed. At this point, Nelson would have stepped straight onto the beach but his route has been obliterated by the funfair carpark. However, if you turn right and walk along the outside wall of the Redoubt you will be able to squeeze through some railings at the seaward end. The reference number of the watercolour is PCM 79/1962. It has been published, in colour in Sarah Quail and John Stedman, Images of Portsmouth.